The Natural Park, in resort Cafaggiolo, is located in the upper zone of the municipality. 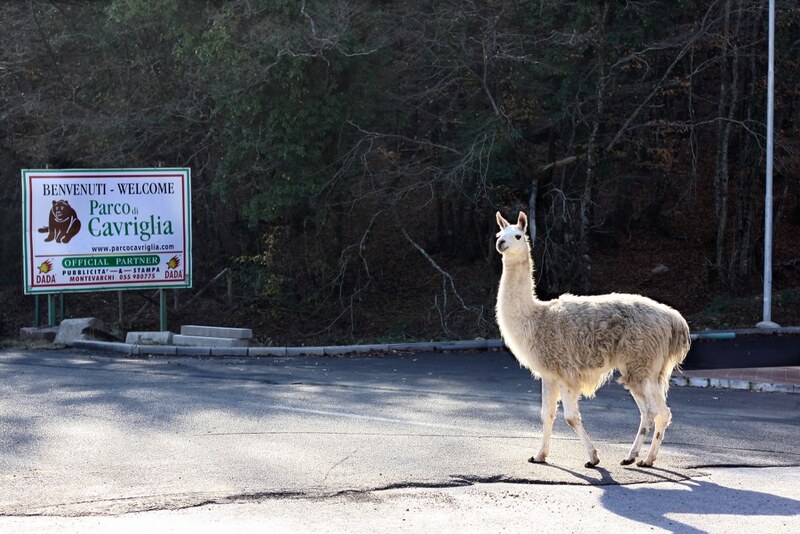 Within the park area are many native animals found in forests of the area, but also the typical farm animals that once roamed the farms of the Tuscan countryside and now, in some cases, face extinction because of the passage from 'rural economy to one dominated by industry. From the Park, with facilities to offer hospitality to tourists who love nature, it is possible a trail through the pavement of an ancient Roman road, get to the ridge of the hills of Chianti. By S.P. 14 delle Miniere, downstream of Castelnuovo dei Sabbioni, there is a deviation that, passing through the quaint village center of Massa Sabbioni, rising to Caiano. Just beyond, in the locality Cafaggiolo, lies the Natural Park of Cavriglia. Founded in the '70s as a framework for the collection of animals from various sources - llamas, wild sheep, monkeys, bears - now, thanks to the changed environment and animal sensitivity of public opinion and local administrators, is turning into a green area, which aims primarily to protect the animals typical of the Tuscan countryside: animals, in some cases, at risk of extinction due to the rapid transformation of agriculture and the gradual disappearance from the farms of typical barnyard animals. The structure contains not only native animals that inhabit the woods that lead down to the Chianti Valdarno, but also poultry such as chicken, goose and pork still in the early decades of the 900 were an important source of livelihood for farming families. The park is also a place of relaxation and residence as being equipped with a hotel, a campsite with bungalows and a swimming pool, a restaurant and a cafeteria. About 600 hectares are numerous trails where you can go hiking, horseback riding, bird-watching and mountain biking. Chestnut and beech trees will not be difficult to find deer, roe deer and mouflon. Then there are the surprises for history buffs. From inside the park winds fact a path that leads up to the side of Chianti, whether through an ancient paved road until you arrive at "The Pietraia" or "The Petraia", one of the highest points of the chain hilly Chianti- Valdarno. In this area some holes dug in the rock are evidence of an ancient necropolis of Etruscan-Roman. From here an ancient path of the ridge leading to Cetamura in Chianti (now the name is preserved by a hill not far from Badia a Coltibuono) settlement since Etruscan Archaic period (seventh century BC) until the Middle Ages. Tourist Card "Cavriglia for you"